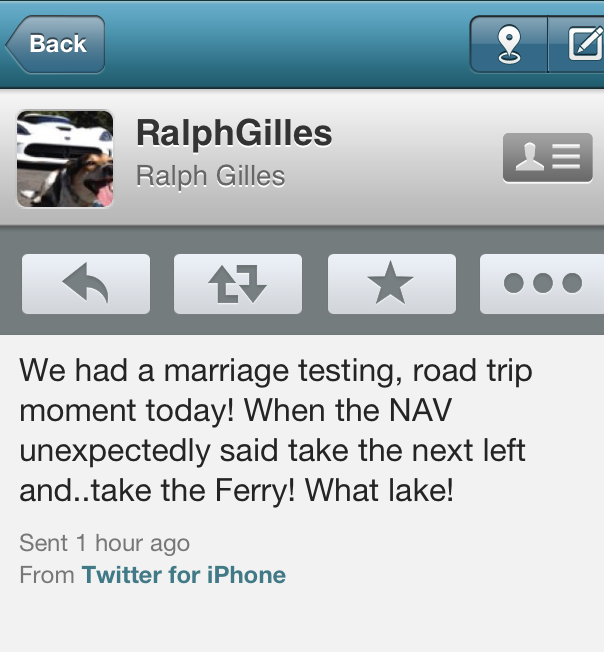 Ralph Gilles, the Chrysler design chief, sent out a tweet today about a “marriage testing road trip moment” during a drive in Italy. Apparently the navigation system in the car he was driving directed him into a lake. Certainly everyone is glad Mr. Gilles reacted appropriately in time, and no harm was done. But it was interesting to find Mr. Gilles having the same kinds of dramas we have been experiencing with automotive navigation systems. I love them. I hate them. I think they are trying to kill me. In fact, we have survived (so far) a bunch of real head-shakers. 1. Searching for an inn, late one night, in the mountains around Zermatt, Switzerland, our Opel rental car’s nav system directed us down what looked like a walking path. “Isn’t that the lodge, right over there?” I asked my long-suffering companion and co-driver, Sherry. It sure looked like we were going the correct way (we were), but we decided veer off and follow the instruction. The trail kept getting narrower and steeper; finally, the going got so tough, the car wouldn’t even go up the hill in first gear. So I turned it around and backed the rest of the way up, clutch smoking in protest. When we arrived at a restaurant, the proprietor was shocked. “How did you get here?” she asked. When I pointed to the trail, she said, “That is what the livestock uses.” In the morning, we about fainted when we saw, in dawn’s early light, we were literally hanging off the side of an alp, with a drop-off thousands of feet straight down, below us. 2. Turning off the main highway in Basilicata province in Italy, heading to a seaside resort in Nova Siri, our Alfa Romeo Giulietta’s navigation system laid out a pretty direct route to the property. 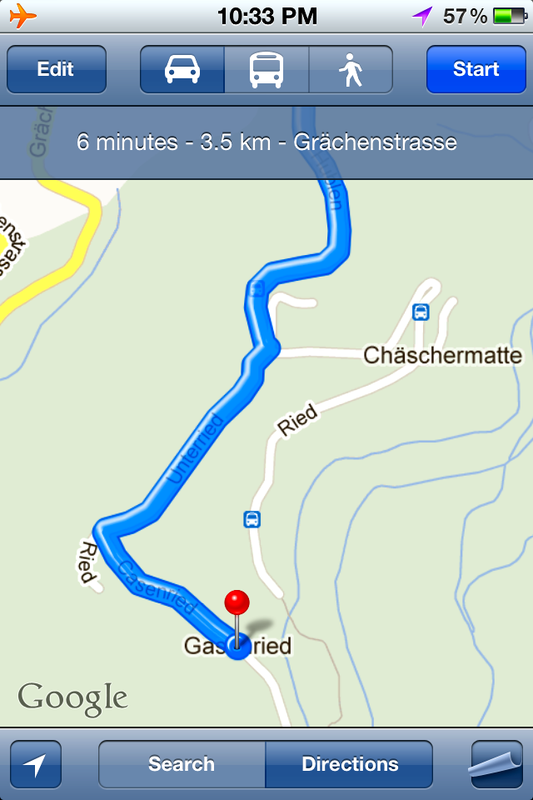 It was less than a kilometer away, it said. But the road kept narrowing. Finally the pavement ended. Finally the road ended – in an apricot orchard. We could see the resort, but to reach it, we would have had to drive through a gauntlet of apricots, then vault a 30-foot-wide irrigation canal at the end. We found an alternate route on our own; the apricots, however, were delicious. Turning back wasn’t an option, at this point, either. In fact, getting out of the car was impossible; I finally climbed out the window. We had to fold the mirrors in, and drag it out backwards, with the help of neighbors. Don’t look at us like that, folks, it was the navigation system’s fault! Sure! 4. Earlier in that same trip, the Fiat 500’s navigation system directed us the wrong way on a one-way street, up a private driveway, and down a couple of dead ends. But the topper was when it directed us to go up 20 stone stairs in front of a church, to a road above. I think it might actually have made it. 5. Trying to navigate the back roads of Provence, France, in a Saab, the navigation system kept taking us through the same village. We couldn’t find a way out. Finally, I decided to make a wrong turn on purpose, to see if I could get the nav to re-calculate a new route for us. It did. But it directed us straight up a hill – on a long set of stone stairs – into what appeared to be a private garden. After admiring the rows of lavender, I turned around and took us back the way we came, to the toll road – a small price to pay. 6. Trying to find a remote restaurant in a valley of Austria’s Wildschonau region, our new BMW 6-Series sedan’s state-of-the-art navigation system started to direct us up a mountainside on a one-lane farm road. The road switch-backed a few times, then petered out in a pasture. It was still directing us to keep going, higher up the hill. The cows in the field seemed puzzled. We turned around and went back down in the valley, and tried again. This time, the nav system directed us up a similar road – on the other side of the valley. Same result, with stunned cows looking on. Where did it possibly think it was sending us? Finally, we followed bike path signs to the restaurant. “Why did you come that way?” the restaurant owner said. 8. A new feature of some navigation systems is a speed limit display for the road you are on. It can be a real aid – when it works. In America, the display relies on mapping information supplied to the nav system maker. In central Europe, the system uses sign recognition technology; it actually has an electronic reader that spots the round speed limit signs along the road. The problems start when a) the sign reader can’t find a sign to read; then the system b) defaults to what it thinks the speed limit is for this type of road (no, the speed limit in your driveway isn’t really 110 k.p.h. ); or, c) construction zones have conflicting signs for the speed limit; or, d) law enforcement arbitrarily decides to slow cars down for accidents, dangerous conditions or heavy traffic. In any of those situations, if you have relied too heavily on the sign recognition tech, you are ripe for getting a speeding ticket, or a trip to jail. You may not know you ran afoul of the posted speed limit until you arrive back home and find a ticket in your mailbox. 9. Touching the screen of some navigation systems in the wrong place can screw up your route impossibly. I did that once, headed to Los Angeles, and the navigation system did something I hadn’t seen before. First, unbeknownst to me, it had picked a address on Cedar St. in nearby Long Beach, instead of Cedar St. in Los Angeles. Second, after I touched the screen, trying to see if I could move the display to see why it was taking me in such an incomprehensible direction, my tapping finger caused the system to set a “waypoint”. The effect of this feature, which I was not aware had been activated – much less offered, was to take me in an infinite loop. After the third lap around the same eight-mile loop, I finally caught on. 10. Finally, on a trip to western Austria in an Audi R8, the navigation system took us up a mountainside, along a tortuous switchback, toward a lodge we had booked for the night. It was a black, moonless night. The road narrowed, became no more than a walkaway, and passed within inches of a couple of houses. The surprised residents peeked out their windows. With what the nav said was the final turn just ahead, the road ended. There was no doubt about this; a cliff was just in front of us. We couldn’t even see the bottom of the dropoff. I got out and scaled the rocks to the “left turn” ahead. It was an iron gate to a stone stairway that headed straight up the mountainside. I climbed up, found the lodge, then found the right road and hiked back to the trapped R8. Backing that quarter-million-dollar car, with its huge blind spots, away from the cliff in the dark was about as pressure-packed an experience as you’ll ever want to have. We’ve all heard stories like the one about the elderly couple who drove off a dock into a German lake because the navigation system didn’t mention to there was a ferry (apparently similar to the instruction that nearly put Mr. Gilles into an Italian lake). 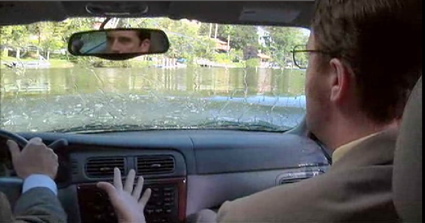 Or the episode of “The Office” in which Michael Scott drives Dwight Schrute into a golf course lake because the navigation system wasn’t clear about where to turn. 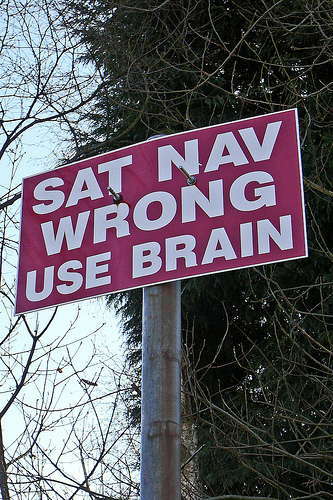 Remember this: Navigation systems can only read lines. They can’t think. That’s supposed to be your job. Or, you could listen to your wife, and ask for directions! « Whatever Happened To The Route 66 Rendezvous? It was reported in La Nazione, so it must be true, that an American woman drove her hire car into the centre of Montalcino using SatNav. 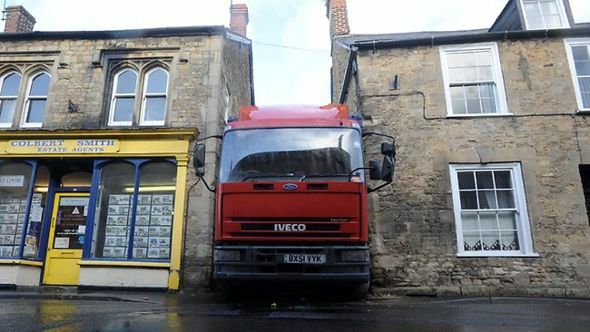 Naturally the road got narrower and narrower until the car was completely wedged. Had to call the fire brigade to push her out backwards. That’s totally believable! After a few bottles of Brunello, it’s hard to walk through the tiny streets of the old town, much less drive!